This project makes use of Seeedstudio's Grove Sound Sensor. Which essentially gives your Arduino ears! The small sound sensor (microphone) attaches to an Analog pin on the Arduino and can be used to detect the level of noise in the surrounding environment. You could potentially use this sensor to turn a light on in your house after recognising a specific clap/whistle sequence. In this tutorial we are going to connect a few LEDs to the Arduino, and get it to listen for a click/clap, and respond accordingly. Have a look at the video below for this project in Action. 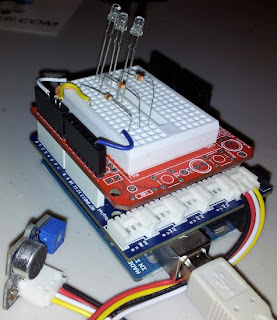 Place the Grove Base shield onto the Arduino UNO or compatible microcontroller. Stick a Mini-Bread board onto the ProtoBoard.